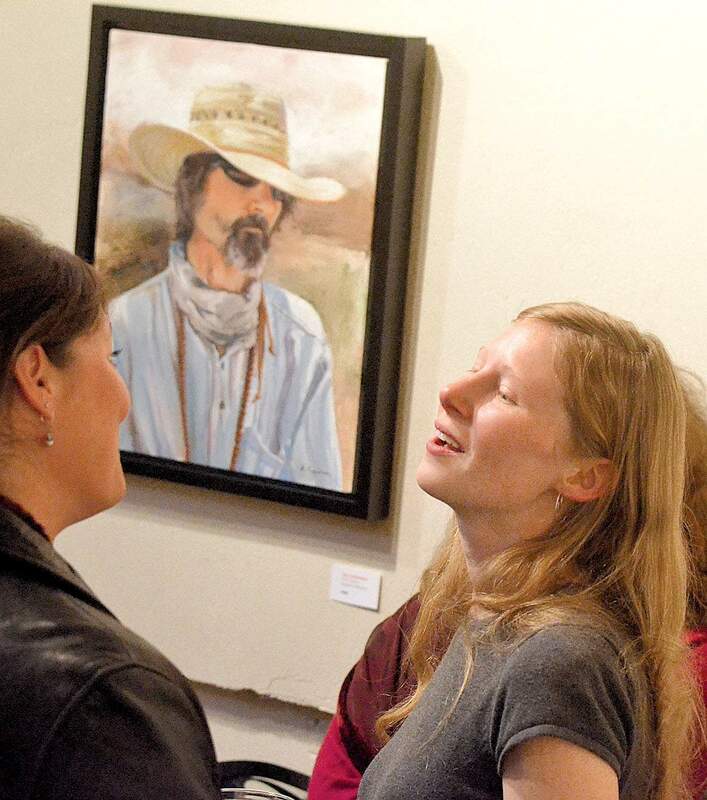 Leanne Beasley, left, chats with artist Elizabeth Kinahan in front of The Fisherman (Mervin Stilson) on Friday evening for the opening of Portraits of Men at the Durango Arts Center. Vernon Greif is greeted by Elizabeth Kinahans painting of Michael Rendon. Its a tricky business for an artist, capturing the elusive essence of what makes a person an individual. In her new show at Durango Arts Center, Elizabeth Kinahan discovers that mysterious something in her on-canvas depictions of local Durango men. 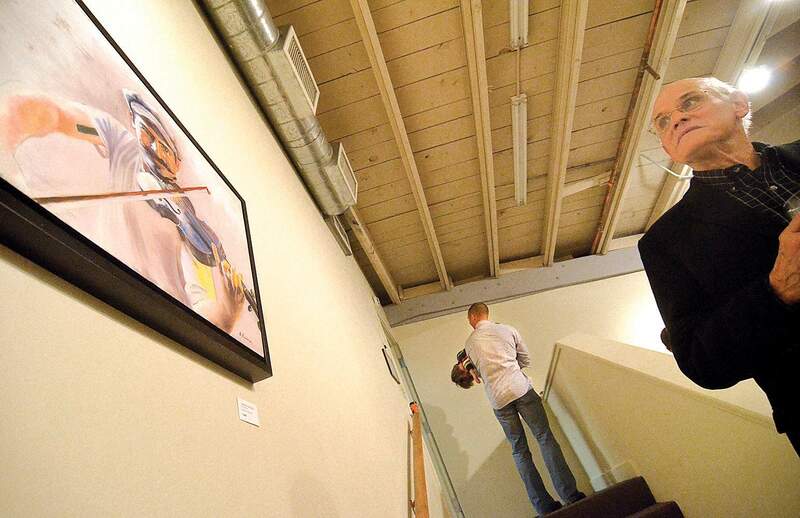 Portraits of Men follows the success of last years The Women of Durango, an all-woman collection of portraits. Where Kinahans women were perfected to the point of fantastical, her men are rough-hewn and organic. In places, Kinahan left facial features unfinished or unrefined in an allusion to the lifetime of stories hidden within. Kinahan began work on Portraits of Men a bit more than a year and a half ago; reaching out to subjects she had long desired to paint. Most of the portraits are the result of photo sessions, though some were based on photographs taken at parties or provided by friends. The subjects are Michael Rendon, Mervin Stilson, Roger Seliner, Tim Kapustka, Nick Kapustka, Ty Iwasaki, Todd Macon, David Halterman, Ted Holteen, Jeff Wollenberg, Slater Bootenhoff, Karma Bhotia, Tom Kipp and Jeff Madeen. A portrait isnt a depiction of who a person is; rather its a painter, photographer or writers interpretation of who that person is. There is much more power in a paintbrush than we give it credit, and Kinahan uses it wisely. Her portraits are kind out of admiration and respect for her subject, but unforgiving to their imperfections. Originally from New Jersey, Kinahan has lived in Durango for the last several years and is an active member of Studio &. Her work is very much influenced by the natural surroundings of the Southwest, and, if you view Portraits of Men in that regard, the show is a representation of the human life we encounter everyday in Durango. About Light, works by Cynthia DeBolt, Ann Friedman and Caroline Reeves Johnson, through Nov. 17 in the Barbara Conrad Gallery of the Durango Arts Center, 802 East Second Ave.
Johnson will present a workshop, Vocabulary of Color, from 10 a.m.-4 p.m. Saturday in the DAC education studio ($75). Portraits of Men, by Elizabeth Kinahan, through December in DAC Art Library. Gallery and Library hours are 10 a.m-5 p.m. Tuesday-Saturday. For more information, call 259-2606.